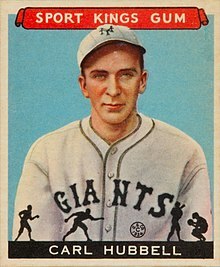 Carl Owen Hubbell (June 22, 1903 – November 21, 1988), nicknamed "The Meal Ticket" and "King Carl", was an American baseball player. He stood 6 feet 0 inches (1.83 m) tall and weighed 170 pounds (77 kg). He was a member of the New York Giants in the National League from 1928 to 1943. He remained on the team's payroll for the rest of his life, long after their move to San Francisco. Twice voted the National League's Most Valuable Player, Hubbell was inducted into the Baseball Hall of Fame in 1947. Besides, there were 50,000 fans or more there, and they wanted to see the best you've got. There was an obligation to the people, as well as to ourselves, to go all out. As far as control and stuff is concerned, I never had any more in my life than for that All-Star game in 1934. A fellow doesn't last long on what he has done. He has to keep on delivering.